PLAY N HOOKY has a complete array of the finest fishing electronics. She is outfitted with all the comforts of a first class sporting yacht: air conditioning, galley, full size restroom, state room, V-berth, plush, comfortable seating, stereo, CD and television. 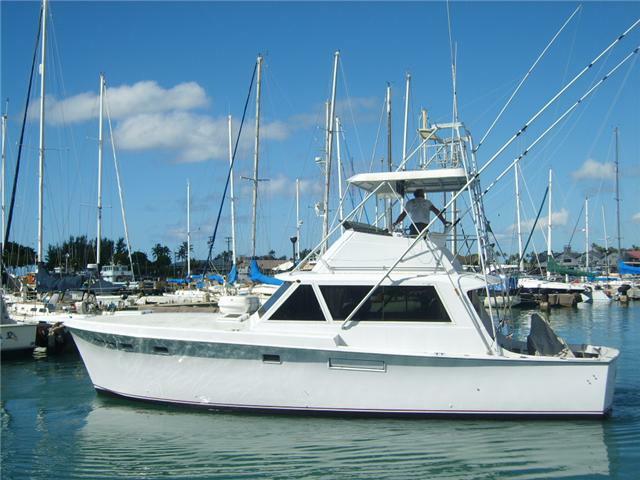 Hawaii Pacific Sportfishing Boat Play n Hooky is located in Hawaii on Oahu's beautiful Waikiki's South Shore. We offer full, three-quarter and half day fishing adventures to some of Hawaii's most popular fishing grounds. Spend the day relaxing and fishing off of the beautiful Island of Oahu as our experienced crew guides you on an exciting day of fishing for Marlin, Ahi, Mahi Mahi and Ono. There's no waiting to get to the fishing grounds we start fishing as soon as we leave the harbor! For your party from one to six people we provide all bait, tournament quality Penn reels with 5O7C custom rods, ice and a US Coast Guard licensed captain and professional deckhand. We will gladly customize a trip with you. Kama'aina and military rates are also available. On a private charter the crew of the Play n Hooky will gladly split the days catch with you up to 50 pounds of whole fish. On a share charter everyone will be offered an eating portion (approximately 2 to 4 pounds) depending on the days catch. All fish weighing over 80 pounds will not be cut and kept by the boat. If you wish to tag and release any fish that are caught please discuss that with the captain before you book. The captain and crew will gladly have your catch professionally mounted and shipped to your home or desired destination. Note: Selling fish helps us keep the cost of the charter to you as low as possible. If you really desire to keep your catch please discuss that with the captain before booking your trip. Please remember the selling of fish and tips is a major part of the captain and crews income.